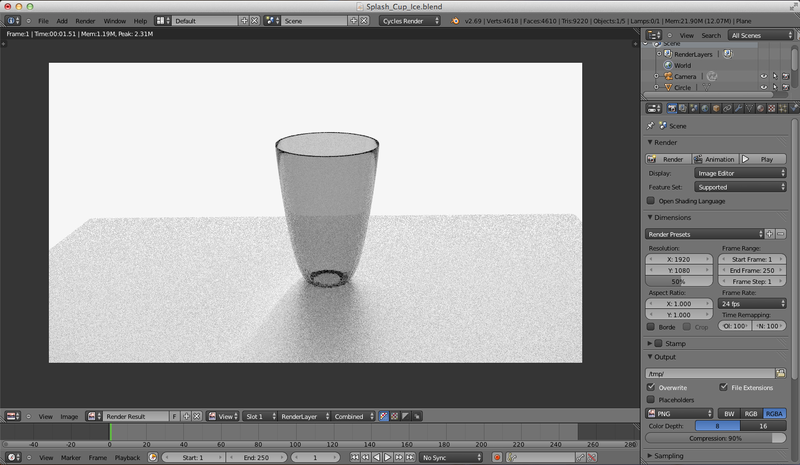 From a previous blog post (see blog post dated 18th Tuesday March 2014) I was in the process of creating a photorealistic blender image of water falling into a cup. I felt that this idea of a photo would be a good one due to the fact that it would help improve my skills in many different areas of blender, such as the fluid system, sculpting mode and transforming mesh objects into what you want. From my previous blog post one of the main things which I was struggling with was the lighting and what colour and strength it should be. As seen from the screenshot below this was one of the things that was really holding me back in begin able to create a crisp, realistic image. One of the main issues which I was doing in the below screenshot was that I the lighting strength was for one to strong, which was causing the material of the object to look slightly washed out. The other problem which should have been obvious to me is that within blender glass is not going to be as realistic against a very light background which I had. Because of this issue, I did some research into what other people had done in similar images, and the from what I could see many of them used a black ground which in the centre had a light blur. This seemed to give the image the correct lighting that it needed and added something different to the image. By this the image was not simply some water falling into a glass there was something else for the viewer to look at. The screen shot below shows how the different light changes the look of the glass. Please note that the camera is at a different position and I had also edited the bottom of the glass so it looked like a normal glass. I personally believe that the darker background with the blur in the centre does make the image look a lot better. This is because it seems to reflect the light correctly of the glass, which obviously is going to make the image look a lot more realistic. 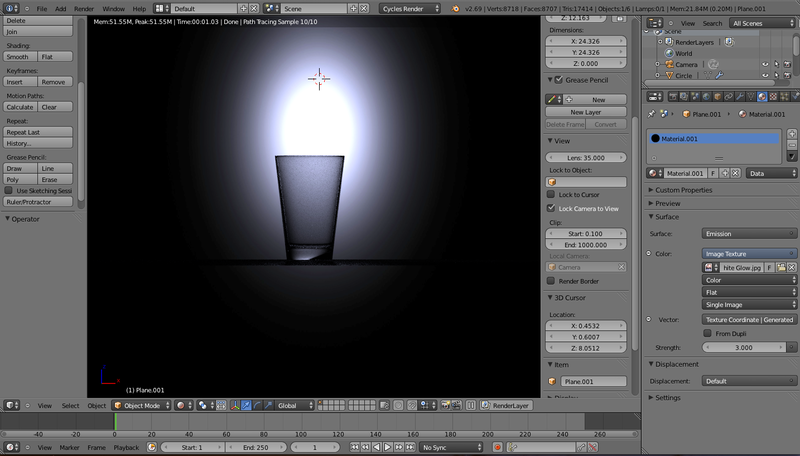 One of the other main problems that I was having in attempting create the water pouring into the glass image was the use of the fluid system within blender. The main reason to why I was having trouble is because I did not set the system up correctly. This is because first of all I had set the fluid system to last for one second however I did not change the times of the time line which meant that the system became confused and did not operate correctly. The second problem that I had was that the water was also coming into fast. This again was my fault because I had increased the speed of the water inflow because the first time the water went in very slowly, however I had not been aware that when I edited the inflow direction that it automatically speeds the inflow of water up. So this again gave me a poor result. However once all these problems were dealt with the system did exactly what I wanted. Above is my finished result. Although it is in my view the best image that I have made in blender, I still believe that there areas of the image that can be improved. One thing that could be improved is that the surface which the glass is on is a little dark and makes the change between the light top of the glass to the dark bottom of the glass a little extreme. I also think that the light source could be increased slightly to light the picture better. 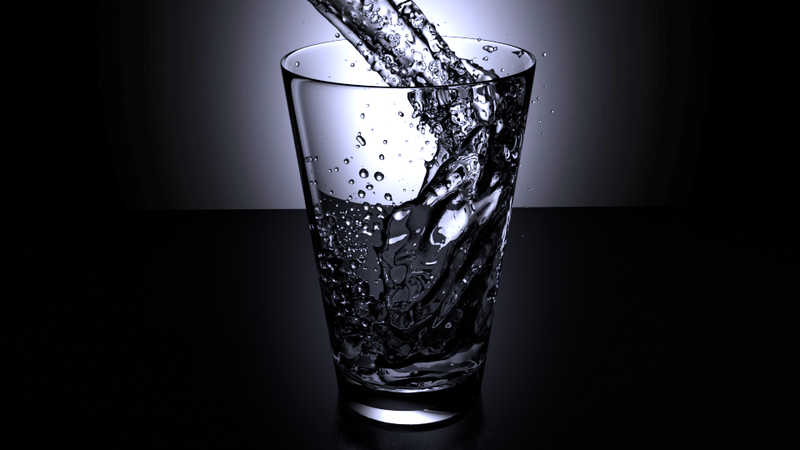 However I am happy with the fact that the water and the glass does look realistic. I believe that with a little editing of the surface and maybe changing the camera angle, I could accomplish my goal of creating a photo realistic image.